This shouldn't be news to anyone but apparently it is. I just learned of a 58 year old man who went missing solo paddleboarding off Pt. St. Lucie during the squalls last Friday. AND, two college girls were blown 3 miles off LBTS Friday afternoon as well in squalls. People need to know that stormy weather can hurt or even kill you on the water down here (and elsewhere in the world for that matter) and to take measures to stay out of such conditions. Paddling in or under the influences of stormy weather can easily mess you up, obviously enough. Guys that rent gear really need to have a strong awareness about this and take steps in advance to protect their patrons. Squalls are usually easy to see and anticipate, the NWS even provides warnings often enough. They can pop up suddenly at times and in other instances you can anticipate them days in advance but in any case you can usually see them before they arrive in daylight. It doesn't take 40 or 50 mph winds plus to take a fun paddle session into the twilight zone, as common as such conditions can be here, lesser winds and fatigue can take a toll with serious consequences too under the wrong circumstances. Lightning comes to mind as another hazard to the highest object for a good distance usually on open water. A squall cloud moves offshore suddenly bringing a strong offshore wind with it. From the Palm Beach Post: "The search continued Tuesday for William Morlock, 58, who left his home Friday to paddleboard off Normandy Beach in St. Lucie County. The U.S. Coast Guard used an 87-foot boat and an airplane in efforts to find him, according to Coast Guard Petty Officer Anthony Soto. The Martin County Sheriff’s Office also helped in the search stretching to Jacksonville." 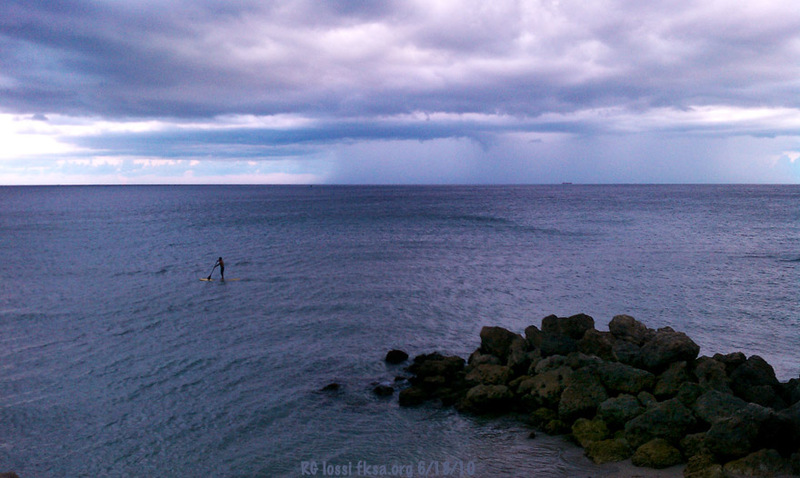 "The 19-year-old college students from Coral Springs had rented paddleboards about 2 p.m. Friday in Lauderdale-by-the-Sea and were in the ocean for about an hour before the sky turned gray and the water became choppy. 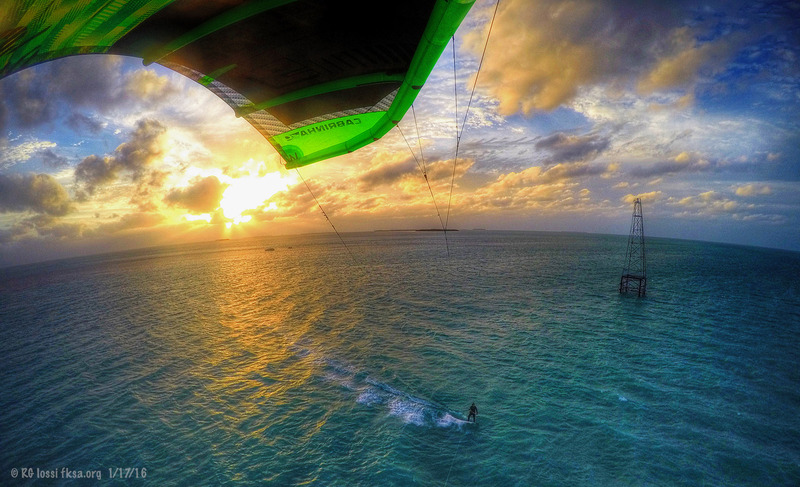 "I couldn't control [the board] anymore because the wind was too strong," Noguera said. The women were on the right side of Anglins Fishing Pier at its midway point when Carpiniello tried to help Noguera but also lost control. "She turned her tail toward me and that was the end of it," Noguera said. "We were both caught in the wind."" The bright colored stuff is bad, it means strong winds, direction changes, lightening, etc. may well happen in those areas and down weather. This squall activity occurred at the same time as the storms which may have been related to the boating accident involving the loss of Perry Cohen and Austin Stephanos off Jupiter. Doing reasonable weather planning, using good PFDs for paddling, letting someone know where you will be and when to expect you, going with others, using a board leash, coming in before the weather changes dramatically, avoiding offshore wind in general, paddling within your abilities all make good sense. Wind can really change the complexion of a paddling session, it can make what was easy very hard particularly for newer paddlers. You need to think ahead and people that rent gear need to do the responsible thinking in advance for their clients. 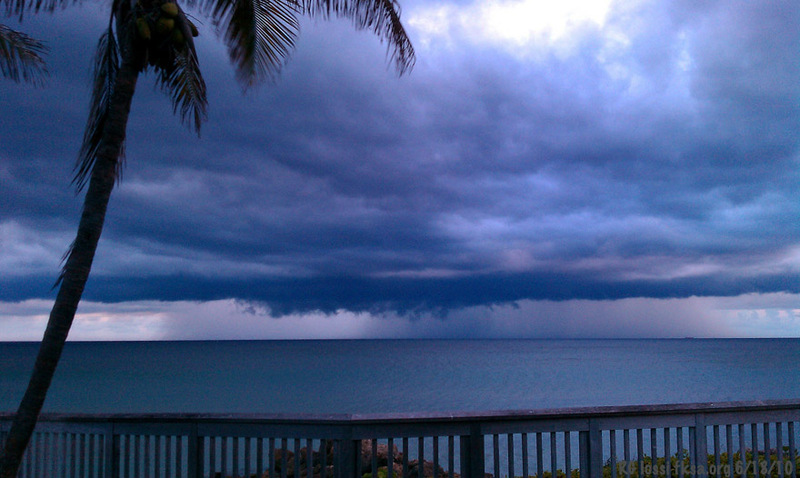 There was this squall wind spike 14 miles away from me in Key West last Sunday. I used weather planning and monitoring to reduce the odds of something like this hitting me where I was kiting to the south. These kind of wind spikes are not that uncommon around South Florida. Another thing to remember, cold fronts usually shift the wind direction around 90 degrees as they move in. You can usually anticipate the arrival of a cold front and the wind shift too, it may be offshore. Also the wind speed can boost substantially with the arrival of such fronts too. Thermal winds, year round, can shift the wind side shore around later afternoon or sunset, the thermals can turn off and the wind can sudden turn offshore if that was the prevailing direction for the area. Have a care out there, think and plan ahead. Last edited by RickI; 07-30-2015 at 12:18 PM. Here is a nice video of a kayaker who got caught out in a squall. He was on the west coast between Tampa and Gainesville, FL. SUPs don't do as well in wind, plus you are a lot higher off the water. Best to work to avoid bad weather particularly given your relatively slow rate of travel. 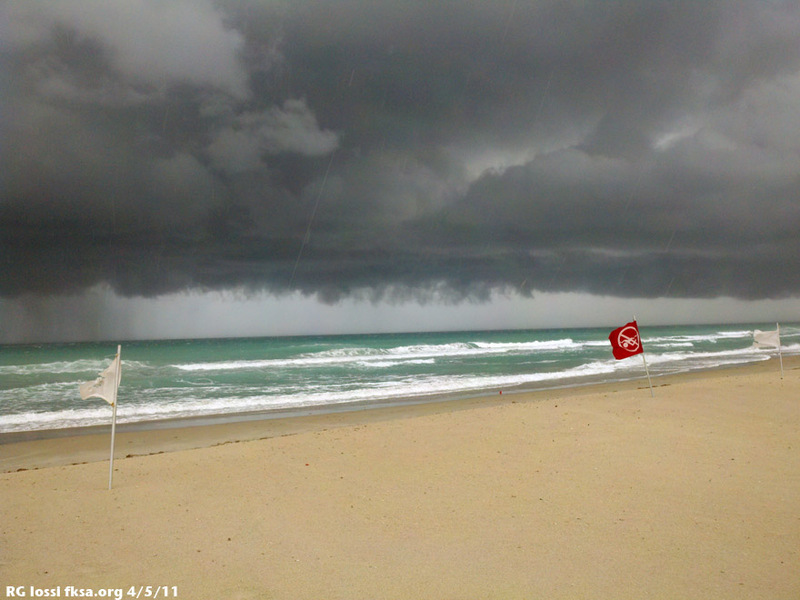 Such squalls are common in Florida and can be a daily thing most afternoons in summer. Tropical systems, fronts can bring them at other times of the year, heads up. You usually can't out run them so you need to plan and act ahead to try to avoid problems.